It’s time to bust out your grill because I’ve got your new favorite beef kebabs! 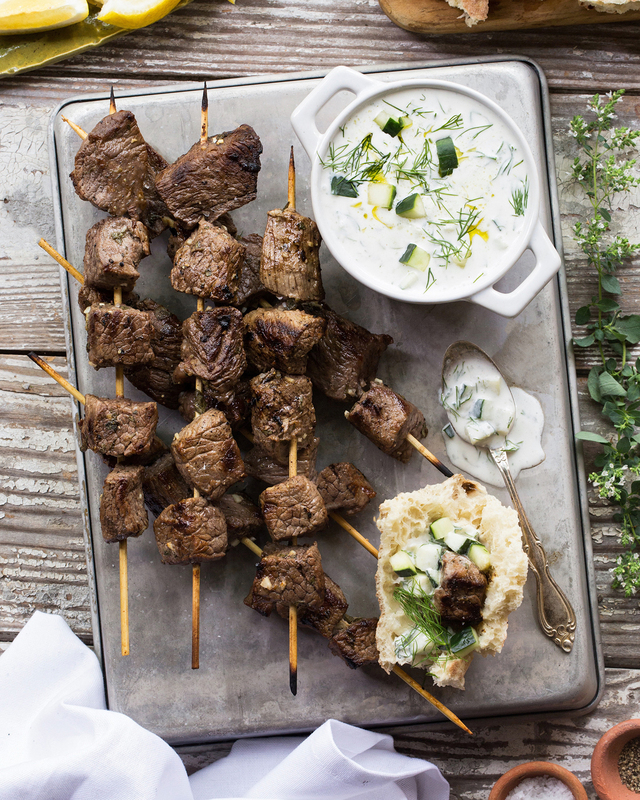 Today we are grilling up some flavor packed Beef Souvlaki Kebobs with a Tzatziki Sauce that will rock your backyard barbecue. Souvlaki is a popular Greek fast food that consists of small pieces of meat that are grilled on a skewer over a hot open flame. I am serving it the traditional way with pita bread and tons of tzatziki. Tzatziki is a Greek sauce typically served with grilled meat that is made with yogurt (dairy free in this recipe), olive oil, garlic, dill, and loads of chopped cucumber. It’s basically the best way to top off any kebab, hands down. The combination of the sizzling hot beef with the refreshing tzatziki in a soft pita makes for a delicious bite! Place the beef chunks, olive oil, garlic, oregano, lemon juice, salt, and pepper, into a large plastic bag. Transfer the bag in the fridge and marinade for 2 hours to overnight. When ready to cook your kebabs, thread the steak pieces onto skewers and discard marinade. Grill over medium-high heat for 10-12 minutes, rotating throughout to ensure even cooking. Serve with Tzatziki and pita bread. In a medium sized bowl, mix together all the ingredients until fully combined. Place in the fridge until ready to serve. This is my favorite photograph of yours. HANDS DOWN. Hi, Eitan. What kind of beef do you use for the beef cubes? Looks delish! This looks fabulous! Where did you buy your non dairy yogurt? Thanks! I found it at Fairway Market. Hi Eitan🙋🇨🇦…your recipes are very easy to follow and your photography is spot on! Thank you so much! I am so happy you like it! I haven’t heard of it.